According to a research, 90% of the companies go out of business within 2 years if they don't have their data backed up. Do you have an Online Backup System? We at 4service.com are providing these companies the opportunity to backup their critical data at a fraction of the usual cost. With our fully automated Online Data Backup Solution, companies of all sizes can now have the exact same offsite data protection services that many Fortune 500® companies have. 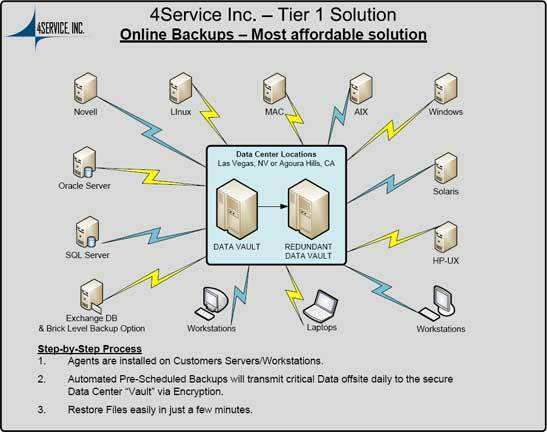 4Service's Secure Online Backup Solution is a completely automated and professionally managed service that backs up your critical information, archives it in a secure, Offsite Data Storage facility in Los Angeles or Las Vegas and makes it immediately available for recovery. Our Automatic Online Server Backups are the most advanced and secure data protection solutions for companies large or small. 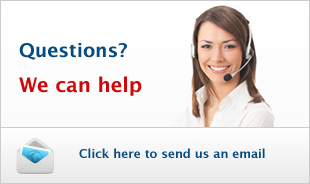 Why 4Service's Hassle Free Online Back up Service? Protecting Critical Data - Your data is continuously backed up as it changes, 24 hours a day, so it's always current. And it's stored offsite at a secure data center utilizing state-of-the-art security technology. Unobtrusive Backups - 4Service's Online Backup Services is an efficient solution to backup servers and end users' mission-critical data by providing a totally invisible backup operation that unobtrusively backs up data at regular intervals without interrupting the organization's workflow...keeping critical data assets protected and maximizing end user productivity. On-Demand Recovery - Instantly recover your data to the point of failure, eliminating downtime and data loss that occurs when relying on a previous day's tape backup. No Tapes, No Hassles, Lower Costs - A "tape-less" backup and recovery solution means no hardware or software purchases, and a fully automated process requiring minimal employee time or resources. This effectively decreases your data protection costs. Additional benefit of Disk Based Backups is that your IT resources will be free for other tasks. Corporate & Mobile End Users - End users and remote users are constantly working with business critical and confidential information. Data loss means lost time and maybe even lost business. With 4Service, backups are reliable, automatic and totally secure. This process is totally safe as all data is encrypted during transmission to the offsite data center. Our online backup solution is so bandwidth efficient, mobile users can easily backup their critical data in minutes while checking their e-mail or searching the Internet. Remote Offices Protection - Our unique solution means data redundancy for remote offices is no longer a costly undertaking. You can rest assured that data from your remote offices is safe and secure in the offsite data center. Your company's remote users will also be relieved to know their data is protected and they can securely restore their data at anytime. For Windows, Linux Suse, Novell and Mac OS X (Apple) Operating Systems. We simply offer the best online backup service for your exchange online backup, linux online backup, mac online backup, apple online backup sql online backup and server online backup. Backup files online securely, hassle free and fully automated! Automatic Online Backup Service for everyone!